Velvet Glove, Iron Fist: Sheffield University: no job too small, results guaranteed. Sheffield University: no job too small, results guaranteed. I don't know how long it takes to cobble together a 'public health' study and get it through the not-very-rigorous review process, but the activist-academics have now been given some extra time to get their story straight. Scottish courts have agreed to accept further evidence before making the final decision over whether Scotland can legally introduced a minimum price for alcohol. The inner house of the court of session met last week to consider the recent ruling of the European court of justice, and decided to hear more material. The final hearing will provisionally be June. Five months should be enough. The only question is who'll be getting the (taxpayers') money for the commission, which journal will print it, and when. The odds on favourite has to be Sheffield University, but other runners and riders include Liverpool and Sterling, both of whom have a solid record for policy-driven research. As for which magazine accepts it, The Lancet is always keen to help but the British Medical Journal and Addiction are also good bets. If I had to put money on it, I would go for Sheffield in the BMJ in May. Watch this space. Introducing minimum unit pricing or alcohol-content-taxation would reduce inequalities in health more than increasing alcohol duty under the current tax system or increasing VAT on alcohol, a new report has shown. Research from the University of Sheffield’s Alcohol Research Group (SARG) compared four policy strategies for regulating alcohol prices to estimate how changes in alcohol price would affect individual levels of alcohol consumption and the subsequent impact on illness and deaths associated with 43 alcohol-attributable conditions in England. 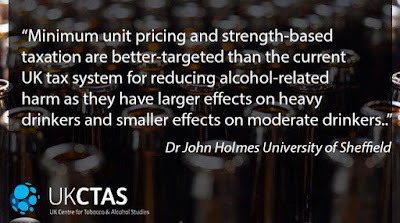 The study, which is the first of its kind, showed that strategies which strongly link alcohol content with the price of drinks were more suited to tackling health inequalities compared to the current duty system where wine and cider are taxed by total beverage volume regardless of strength, and duty rates per unit of alcohol vary widely between different types of drink. Minimum unit pricing is under consideration in several EU countries. Its legality under European Union law depends in part on its ability to achieve additional advantages or fewer disadvantages for public health and free trade compared to existing policy options, particularly tax increases under the current system (volumetric taxation is not currently possible in the EU as taxation of wine and cider by ethanol content is prohibited). This study suggests that, compared to a commensurate increase in existing alcohol taxes, minimum unit pricing is more targeted to the population at greatest risk of harm (i.e., disadvantaged heavy drinkers) and is thus more effective in reducing health inequalities, a key public health goal. The current judgment may set legal precedent not just for minimum pricing for alcohol, but also for potential future policies relating to other commodities such as sugar and fat. Okay, it's not May and it's not The Lancet (it's in PLoS One, which must have a quicker turnaround), but it is Sheffield University. Does anybody else even bother putting in a tender for these contracts? Is it a closed shop? This is the same Sheffield University team that produced multiple models purporting to show that minimum pricing reduces alcohol-related deaths. The same Sheffield University team that produced a model showing that minimum pricing isn't really very regressive after David Cameron rejected minimum pricing for being too regressive. The same Sheffield University team that produced a model showing that people shouldn't drink more than 14 units a week when the Chief Medical Officer needed evidence to show that people shouldn't drink more than 14 units a week. Now they've produced a model showing that minimum pricing is more effective than taxation just when the Scottish National Party needs evidence that minimum pricing is more effective than taxation in order to win a crucial court case. This is the equivalent of a murderer's mistress showing up in court to testify that she was with him on the night he killed his wife. It is hard to imagine policy-based evidence being more shameless and blatant than this.